I watched an ashtanga documentary this past summer and there was a specific part that stuck with me. The interviewee said something to the effect that you can’t flirt with the ashtanga practice for very long. Due to the demanding nature of the practice, you either commit or you move on. I have definitely found that to be true. It took until the last few months for me to become dedicated enough to do my practice six days a week, before that I still had one foot out the door. For me, it was partly due to my huge fear of failure. If I really committed to the practice and admitted that it was important to me, what would happen if I couldn’t do it? That was scary. I didn’t want my pride to be wounded. There is also the challenging aspect of the hour that it is necessary to be on the mat. Mornings are not my thing and my work schedule can make it difficult to keep a routine. I have gradually found myself more often scheduling work around yoga. I still fight myself to get out of bed when it’s -30 outside and my cats want to cuddle. The key is to not think, just do, much like the practice itself. I still congratulate myself on making it onto my mat each morning. I’m trying to be my own cheerleader, which I think is important. The practice week started off well for me today. The decreased feelings of stress and the lack of time pressure on Sunday is a magical combination. I got to AYO in time to get my most favorite spot in the room and do the opening chant with everyone. I didn’t forget any poses. I got some lovely assists today and my body was cooperative. Supta kurmasana is really coming along. I’m no longer trying to squeeze and shift into position from kurmasana, but rather sitting up and adjusting my legs before coming back down and crossing my feet. I think Tuesday I am going to actually try to cross my feet behind my head before coming down. I played with it at home his evening and could do it on my couch, so we’ll see how that translates on a cold morning. 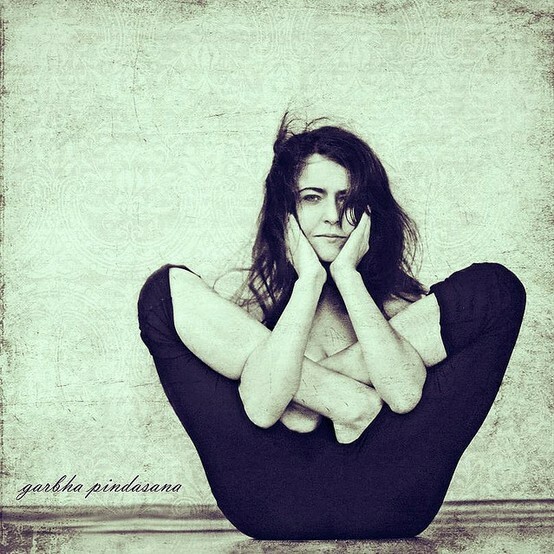 I finally got my arms through in garbha pindasana today, which felt like a great step forward. I couldn’t hold it to roll because my lotus is still not there. I think I may have arm bruises, but it was worth it. Back bends were great today. Drop backs are getting more and more stable and I’m gaining confidence. I actually got my fingers up my heels today in my assisted drop back, which was both sickatating and awesome. I couldn’t get my heels quite to the floor, and my breath was somewhat laboured. I need those psoas to stretch out to take the pressure out of my back a bit and make it possible to straighten my legs more. New moon tomorrow means no practice tomorrow. I am thrilled at the prospect of an extra hour and a half of sweet sleep!